He has very nice stuff, and I have been tempted before. Not a great shot but you get the idea, these are soem of the new Cucasian Cossacks, unbased in this pic sorry. 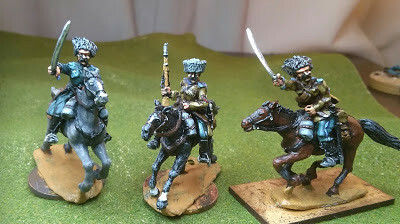 They look a lot more realistic than the Cossack's (from another maker) I painted last year.....hmmmm can I justify redoing the unit.....you betcha! Ha, ha. Well I had initially planed to be a very few to add soem variaty to my Copplestone who they do complement reasonably well by the way (foot more so than cavalry) but I ended up getting enough for 3 extra units of Cossacks, one is finished and been in use for a while another recently finished will appear on the blog soon, the other I have yet to start. They are really nice figures. Looking at your blog Roger you are an even bigger Cossack fan than me! I could not see any photos of the Siberia Miniatures ones though are the under a different label? I have a post still to load with the Studio Siberia Cossacks, all the pictures are there just missing some text, will be uploaded in the next week or oo. That said I did think I had some on there so mabe I need ot hav e alook through for you. Try these, listed under RCW label rather than Cossacks. Each one has a number of manufacturers inclding Studio Siberia as they are mixed in many of my units. Just wanted to add my ha'penny worth in praise of Siberia Miniatures. Great models - the detail isn't generally as sharp as Copplestone but the figures have a real elan about them, (rather more exciting poses than Copplestone). The horses are superb. The cavalry and Cossack plastoons are the best, I'd say. And they come packed in genuine Russian tea packets for added local colour! Not my area of expertise I am afraid but best of luck. You might consider just buying the ones that match, let us know how you progress. I have managed to paint up a few more, will use these as markers in games may be. Oh, that's the pack I absolutely need to get. And maybe Defence of the Manor. But those Bolsheviks for sure. Good painting on very nice character pieces. Really nice work!! Your painting really brings out the action and personality of these great minis. Very nice. Miniatures and PJ both.